Quinoa has become so popular it is hard to believe this healthy grain was virtually unknown in North America 30 years ago. People eagerly adopted its nutty flavor and high nutritive values into gluten-free diets because it is largely accepted as a naturally gluten-free food. But questions sometimes come up about its safety, and food scientists and other experts have recently taken steps to clear up any uncertainty. Tricia Thompson, RD, owner of the website Gluten Free Watchdog, says the primary concern is whether quinoa is cross-contaminated with gluten from other grains. In 2010 she co-authored a pilot study to test 22 inherently gluten-free grains that were not labeled gluten free. 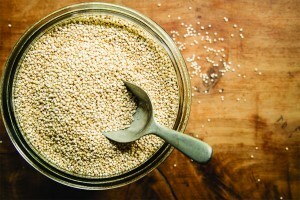 Quinoa was not included in the study, Thompson says, because she “could not find quinoa seed or quinoa flour that was not labeled gluten free.” The study found that some samples of other naturally gluten-free grains contained gluten greater than 20 parts per million, the level considered safe for people with celiac disease. The results raised questions about the possibility and extent of cross-contamination of gluten-free grains by those that contain gluten when they are grown, transported, milled and packaged. Quinoa has been considered reliably gluten free partly because its history and native habitat isolated it from contact with other grains. Developed over millennia by indigenous people in the Altiplano, a plateau in the Andes, the plant flourishes in high altitudes, cool temperatures and arid conditions that other crops will not tolerate. For example, Andean Dream quinoa products originate in the Salar de Uyuni in Bolivia. It is the world’s largest salt flat, full of nutrients but too saline for most other plants to grow. Unlike oats and other grains, which might occupy the same fields where wheat was previously cultivated, traditionally grown quinoa did not have to share living quarters. Consequently, it was not susceptible to cross-contamination from gluten-containing crops, at least until recently. As the demand for quinoa grows, farmers seek more ways and places to grow quinoa. Genetic diversity allows the plant to adapt to different climates. Cultivation in South America soon spread to lower altitudes. In 2011 this situation raised controversy over the use of quinoa during the Jewish holiday, Passover. Wheat, rye and barley products are forbidden, but quinoa offered a reasonable alternative, especially for individuals on gluten-free diets – until evidence showed other grain in the mix. A mashgiach, a supervisor of Jewish dietary law, dispatched to South America for investigation found cause for concern: Quinoa was growing near other crops with instances of direct contact. This compromised the quinoa, making it unsuitable for Passover, during which any potential for contact with wheat, barley and rye must be very strictly avoided. And it caused concern for those with celiac disease. Under supervision from Star-K, a Kosher certifying agency, some quinoa products from retailer Quinoa Corporation and wholesaler Andean Naturals are now handled according to strict standards and approved for use during Passover. Meanwhile, certain strains of quinoa have taken root in North American soil and become viable for small-scale commercial production. A majority of quinoa companies take precautions to prevent cross-contamination and clearly label their products gluten free, but that’s not always the case. White Mountain Farm has been growing, breeding and selling in Colorado since 1984. Vice President Ernie New says the company takes no precautions to isolate quinoa from other crops: “Our farm has crop rotation. We rotate it with potatoes, we rotate it with green manures, and we rotate it with alfalfa.” Wheat might be grown in the same field in a different year, he adds. “If there is wheat or barley in the quinoa, it normally comes out in the cleaning,” he says. The cleaner utilizes screens to eliminate differently sized seeds. A dry polishing process removes the characteristic bitter saponin coat of quinoa. They do not use a rinse and dry method to wash the seeds because the process would render the seed lifeless. New says, “We have a clientele that wants a live seed” that can be sprouted. So White Mountain Farm’s products may come into contact with other grains, and they are not labeled gluten free. However, other producers take numerous steps to ensure the quinoa is gluten free. Saskatchewan-based Northern Quinoa Corporation grows NorQuin Brand quinoa on the Canadian Prairies as well as in South America. General Manager Michael Dutcheshen says the company operates a gluten-free facility. “This includes requirements for our grower contracts to not plant quinoa on land that previously had wheat,” he says. Northern has moved into a new processing facility. While not yet certified gluten-free, it does not process any grains known to contain gluten. David Schnorr, president of Quinoa Corporation, based in California, says there are three points to watch for contamination by other grains: in the field, in the processing plant and in the packing plant. “Our product is grown in Bolivia up in the Altiplano where there are no other grains being grown,” he says. The processing plant in Bolivia strictly processes only quinoa, as does Quinoa Corporation’s packaging plant in California. Andean Dream also follows strict safety protocols with its quinoa cookies, soups and pastas, says Ingrid Hirstin Lazcano, founder and owner. The products contain no gluten, dairy, soy, corn, eggs, cholesterol or trans fats. Employees must change clothes when entering the plant and change again for lunch breaks. Andean Dream uses the ELISA test to ensure the end products are gluten free. “We consider ourselves an allergy-free line,” says Hirstin Lazcano. “We take great care in producing the finest-quality products, to make sure that they’re handled in a way that is safe for customers.” Gluten Free Watchdog tested Ancient Harvest Quinoa Pasta (elbows) and Quinoa Flakes from Quinoa Corporation, Andean Dream Quinoa Cookies (coconut), Ancient Harvest quinoa and Arrowhead Mills Quinoa Rice & Shine. “All came in below the lower limit of quantification, which is five parts per million,” Thompson says, well below the standard for gluten-free certification. Rachel Begun, RD, specialist in glutenrelated disorders and spokesperson for the Academy of Nutrition and Dietetics, says, “The safety of gluten-free whole grains comes down to harvesting and manufacturing practices.” To ensure safety, she recommends purchasing certified glutenfree quinoa products or quinoa from manufacturers who test the final product to less than 20 parts per million. “It’s pretty easy to find certified gluten-free quinoa products at natural food stores and even mainstream supermarkets,” Begun says. In the U.S., once the Food and Drug Administration approves rules for glutenfree labeling, any product labeled gluten free would have to test to less than 20 ppm. Proposed rules would require any naturally gluten-free food—including quinoa—that is labeled gluten free to also say that all other food of the same type is also gluten free. A final definition for use of the glutenfree label had still not been approved at press time and it’s not clear how naturally gluten-free grains will be handled. Thompson says the FDA is aware of the crosscontamination study. Health Canada, by comparison, has set a maximum of 20 ppm from cross-contamination in order for any food to be labeled gluten-free. they have worked to build consensus about safe practices for equipment, storage and handling. Massong says he hopes additional funding will become available for a pilot program during the 2013 growing season. However, cross-contamination has not been the only question posed by food scientists. Two recent studies focused instead on proteins naturally occurring in quinoa. All seeds are naturally packed with protein to store energy. Gliadin is the protein component of wheat gluten that triggers celiac disease. Quinoa is considered a pseudocereal – not a grass like wheat, but a broad-leafed plant related to spinach. The food part is actually a fruit. Its seed storage proteins are distinctly different from gliadin. They are considered safe for people with celiac disease. However, scientists do not like to take safety for granted. Mauro Rossi of the Institute of Food Sciences at the National Research Council, Italy, notes that it is important to perform immunological tests before declaring foods non-toxic to people with celiac disease. He co-authored a 2011 study, published in Molecular Nutrition and Food Research, which tested quinoa, amaranth, millet and teff proteins on tissue samples from people with celiac disease. There was no reaction. All of them passed the test, adding to the evidence these are safe foods. A second study published in the American Journal of Clinical Nutrition in 2012 produced slightly different results. It surveyed 15 varieties of quinoa from different parts of the Andes. Again the proteins were tested on tissue samples. While most were unreactive, samples from two of 15 cultivars triggered an autoimmune response in tissue samples from people with celiac disease. Thompson agrees. “Based on everything we know, quinoa is a naturally gluten-free pseudocereal, and [individuals with celiac disease] can include it in their diet as long as they make sure that the quinoa is labeled gluten free,” she says, noting that’s almost always the case. She suggests getting creative with quinoa in the kitchen. While it’s a great replacement for rice in grain dishes and salads, it’s also delicious as a hot breakfast cereal, incorporated into baked goods, and as part of a gluten-free coating for fish or chicken. The overall verdict is clear: food scientists, dietitians, celiac advocates and producers consider quinoa a healthy dietary component of the gluten-free diet. Van Waffle is a freelance journalist based in Guelph, Ontario, Canada. He has cooked gluten free since 2008. He blogs about adventures in urban nature, local food and gardening in Speed River Journal (vanwaffle.com).